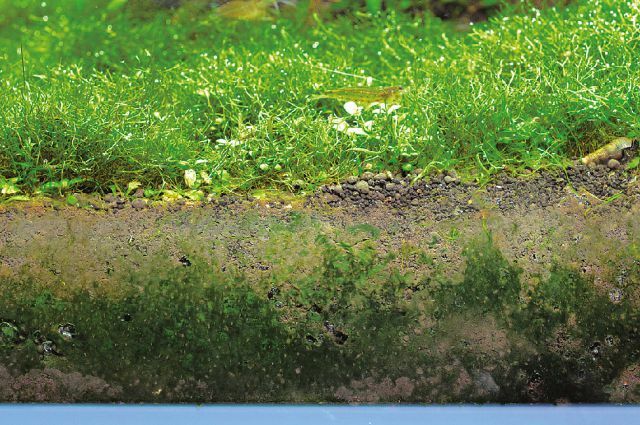 Among Aqua Soil series essential for the substrate of Nature Aquarium, ADA Amazonia is most effective in promoting the growth of aquatic plants and most aquatic plants grow healthy and beautifully with this soil. On the other hand, ADA Amazonia is a substrate material having a strong character and certain techniques are required to use it. Let’s learn more about ADA Amazonia to use it better and make a beautiful aquascape. The greatest feature of ADA Amazonia is in promoting the growth of aquatic plants. The secret is in its base material – natural black soil containing rich nitrogen and organic compounds. But it does not mean that any black soil will do. The base soil used for ADA Amazonia is very rare, relatively sticky black soil rich in plant-derived compounds and it greatly differ from ordinary black volcanic ash soils. Nitrogen content is a major factor that determines the growth rate of aquatic plants. ADA Amazonia contains outstandingly rich nitrogen and immediately after it is laid in aquarium, a large amount of ammonium (NH4) leaches into water. Ammonium is not toxic to fish and shrimps; however in an environment where pH level is higher than neutral (above 7.0), ammonium is converted into highly-toxic ammonia (NH3) or into nitrite (NO2) in the nitrification process driven by nitrifying bacteria which convert ammonium into highly-toxic nitrates (NO3). Therefore, it is not recommended to add fish or shrimp to an aquarium which is still in the initial stage where ammonium level is high. Once the aquatic plants have grown to cover the substrate and nitrifying bacteria in the filter have started to function adequately, ammonium and nitrite are not detected in the aquarium. It is advised that adding fish and shrimp to aquarium should be two to three weeks after planting of aquatic plants. ADA Amazonia is originally acidic, with a pH level of 5.0-6.0, and it makes water more acidic. If water change is performed using water with a pH level close to neutral, the pH level of aquarium water gradually increases towards neutral. On the other hand, if alkaline water with a higher pH is used for water change, ADA Amazonia´s function to lower pH level is weakened and this can lead to various adverse effects. Aquatic plants usually perform photosynthesis actively and grow healthy in acidic water with lower pH and carbonate hardness (KH) levels. That is why mildly acidic water realized by the use of ADA Amazonia is suitable for growing aquatic plants. In contrast, in mildly alkaline water with a pH level higher than neutral, aquatic plants do not show active photosynthesis and their growth is slowed. On top of it, mildly alkaline water promotes the leaching of humic acid contained in ADA Amazonia and aquarium water turns to yellow or brown. If the tap water used for water change is around pH 8.0 or high in carbonate hardness, it is recommended to use "be Soft", an additive effective for lowering pH and carbonate hardness levels, during water change to improve the water quality. ADA Amazonia is provided in the form of granule made of softly baked soil. If the bag of ADA Amazonia is left open and the granules are excessively dried or if the granules crumble into powder due to rubbing during transportation, the water of aquarium with ADA Amazonia substrate can become cloudy after water is poured into the tank. When the water of planted aquarium turns cloudy after water is poured for the first time, remove all the cloudy water and pour new water slowly. If the problem is not solved by one round of entire water change, repeat the water change or pour fresh water while draining the cloudy water (refer to the following Q&A section). Be sure to turn on the filter only after the water becomes clear. If the filter runs with cloudy water, fine particles from soil suspend in water and this can cause white turbidity due to overgrowth of bacteria fed on organic compounds contained in these particles or green water due to algal bloom fueled by phosphorus in the particles. These substrate soil particles can also be stirred up by the water flow from the filter directly into the substrate or the filter absorbing soil particles due to its water inlet located too near the substrate. These waterborne soil particles will reduce once the foreground plants and other aquatic plants grow thick enough to cover the entire substrate. In the case where ADA Amazonia is used for an aquarium without any aquatic plant, these soil particles will continue to appear in water. It is advisable to plant aquatic plants as soon as you lay ADA Amazonia in the tank. It is not recommended to run the filter without planting. 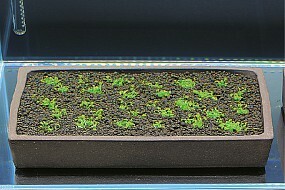 Glossostigma elatinoides directly after planting and three weeks after planting. Nutrient-rich ADA Amazonia helps healthy growth of aquatic plants. My aquarium water turned cloudy after I poured water into the tank using a pail. How should I pour water to avoid cloudy water? If you can connect a hose to a water tap, it is recommended to use a hose to pour water into the tank. When you pour water into a tank without any water in it, you should let the water trickle out of the hose and flow down on the layout materials such as driftwood and stone. Even if you pour water in this way, the water becomes cloudy to a certain degree if fine particles are coming out of ADA Amazonia granules. 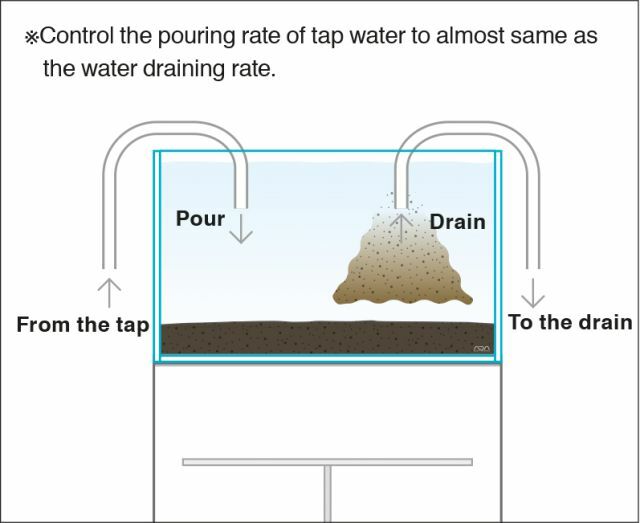 In this case, try to pour water into the tank with a hose while draining the same amount of water with another hose. When you do this, control the temperature of the water to be poured into the tank to about 25°C by mixing tap water with some hot water, and then add an appropriate amount of chlorine neutralizer (such as Chlor-Off) to the tank. I laid Amazonia in my tank in which I keep Red Bee Shrimp, but the water is always cloudy. How can I solve the problem? 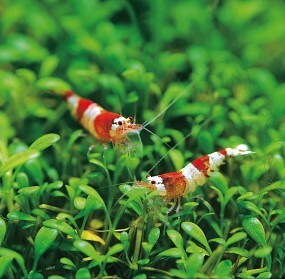 Shrimps such as Red Bee Shrimp and Caridina Japonica peck on ADA Amazonia granule. So, if the substrate soil is exposed, soil particles are always produced by this behavior of shrimps and the water is cloudy at all times. 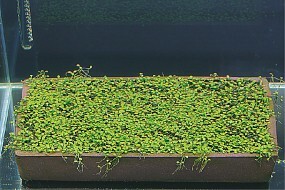 ADA Amazonia is basically a substrate material designed for planted aquarium. If you plant foreground plants that spread sideways, the cloudy water will eventually be solved. But if your tank is used only for keeping Red Bee Shrimp, you need to be prepared for some turbidity in the water. How long will the substrate built with Amazonia last?